Not the greatest anime movie I've seen, but definitely far from the worse. The plot is kind of predictable but the fact that it's not a filler movie that pulled a plot out of its arse, it actually provides us some background story of All Might and adds to his characterization earns an 8/10 from me. Story: 8/10 Plot didn't really get me super excited as I watched (maybe I was expecting too much after seeing the plot of this series). The movie's plot is rather simple. Twists are predictable. But the fights and character interaction makes up those flaws. Art: 7/10 some part of the art gets super bad, like those screenshots of Naruto va Pain where the character faces are all messed up and weird. But for the most part the art is pretty good, especially for the final battle. Man, it's great! The California Smash is epic too! Sound: 9/10 Even till now, the ending song's still stuck in my head. I can hum it right now if you want... and the voice actors are great of course, as always. Character: 9/10 Younger All Might. That sums it up why it's good. Enjoyment: 8/10 I had high expectations of it and wasn't...exactly disappointed so I'm giving it an 8. Particularly that Theme Park place looks interesting, deffo wanna go if possible. That's perhaps the part I enjoyed the most, watching Bakugo, Kirishima, Todoroki, and Izuku fight their way to the top spot and all those cool gadgets Izuku tried on lol. Overall: 8/10 Not bad for a first movie. Definitely worth the watch. You'll learn quite a lot about the bnha world. Still, I'm hoping the next movie will be better. 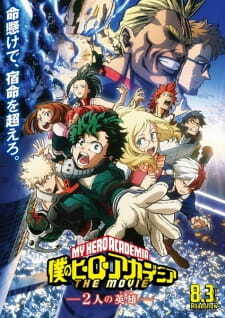 Boku no Hero Academia the Movie: Futari no Hero is predictable, from the very beginning, but still a typical shounen movie that will make you smile. It's an enjoyable movie, but this is overshadowed by the fact the artwork looks like a budget episode from the series (most of the time anime movies have better animation, but I find it's the opposite here). They introduce the new characters well. Melissa despite being a little bland you can get behind her actions. Dave as well, when you find out his motivation and relationship with All Might. Though I find the movie gives quite a bit of clunky dialogue with the characters, and at times it seems awkward, as it feels like the characters are just speaking "exposition". There's also a large beginning portion of the movie in the first act dedicated to the the same flashbacks you've seen a hundred times in the anime. I think the stories main problem is adding almost to many of the classmates, some of the kids from UA just happen to be on the Island, and aren't intricate to the plot at all it's just a shot of them in the hotel room, and it's kind of a pointless addition. The characters who take part in the final fight have a purpose, and as they move up the floors you can get behind their actions, but it almost feels they brought to many of them, and would have done better with a tighter cast of just five of them. The other problem is, a lot of the plot is just predictable at the end, you can almost see every turn coming. The final fight also used 'the power of friendship' trope that I often find the show usually doesn't resort to, making the final encounter almost a bit redundant as it keeps going. The use of the soundtrack to kind of felt like they were checking off items in a box, making sure to hit every one of the the classic music from the series. At times these are used epic, other times though it feels really out of place and like they should have used an original track and not tried to force one we've already heard that doesn't quite fit the scene. Overall it is a good movie with a few quick laughs (also a lot more guns then ever seen before, they really are in America now, huh), but the art almost makes it feel like a TV special and like the movie was rushed because of all the hype going on with the series. But if you like the anime, you'll probably like the movie, so it's worth taking a look. This movie is what you would expect from a MHA movie. It centers around the lovable and diverse cast of characters, all in a self-contained arc of heroism and villainy. I walked into this movie expecting well animated action scenes mixed in with fun character interactions and dynamics. The movie did indeed match my expectations in that regard. Not the strongest aspect of this movie, as it was pretty predictable and cookie-cutter for a movie about heroes. The plot can be basically boiled down into good guys hitting bad guys - which pretty much completely sums up the content of this show. Not all is as mundane as I am making it sound though, as the movie also contains some narrative points involving All Might that I'm certain many would find interesting. Additionally, there were some genuinely thoughtful and cute scenes scattered throughout which stands out amidst the simple (but by no means bad) storyline. Yet again, this is the same art style we are used to seeing with the TV series. It doesn't seem like any extra effort or time was put into the drawing and framing of each shot. The art was great to begin with, so no complaints here. We got more of what we already love. Oh, and I can't talk about art without mentioning the fight scenes. I'm not going to spoil anything - but trust me they seem to have went the extra mile with those. The classic MHA soundtrack. I think most, if not all of the OST is used somewhere in this movie. Once again, the OST is great. So no complaints here either. Not all the characters from Class 1-A is focused on in this movie, which is reasonable considering that it may turn out to be an animation and narrative nightmare for the staff over at BONES to include and do justice to so many of the characters we know and have grown attached to over time. The movie still faces this problem of no real 'character development' and I use this term loosely because it can be argued that there is. However, the point I'm trying to convey is that nothing much in this movie is consequential in affecting the wider narrative. The movie chooses to base the character's conversations on pre-established character dynamics instead. With a weaker cast of characters, this may prove to be a problem. But due to the sheer charisma and good pre-established relationships, this doesn't serve to be much of a problem in this film. I got to watch this movie in a Japanese cinema, which definitely played a part in affecting my enjoyment of it. The characters were fun to watch, the fight scenes were exciting and clever, and the fan-service uh... was there (it honestly got to the point where it was straight out cringy at times for me, but I'm sure people would enjoy it nonetheless) - what more could you ask for. My Hero Academia The Movie, is by no means groundbreaking or remotely close to it. It is pure fun. If you like the series already; watch this movie. And if you don't; you shouldn't go into this one expecting it to be any different. I watched this movie some days ago and it's one of the worst movies I have watched in a long time and entirely just feels like a cheap cash grab. The story is the first big problem with the movie because the movie relies completely on plot conveniences and it's incredible just how predictable everything is I literally knew how everything will end in the first 10 minutes of watching it. Simply put, the art/animations in this movie are horrendous and it's unbelievable that Studio Bones released it like this. In some scenes they used really ugly looking CGI which didn't fit at all and somehow it feels like they just didn't cared about the movie at all and just wanted to get it quickly released to cash in on bnha fans which is a shame because the main series looks actually amazing at parts. The OST in the movie is good and it has a lot of nice tracks which all fit to the scenes in which they play and there isn't much more to say about the OST, but it is the strongest part of the movie. The movie features for the most part the same characters we know from the series and it mostly seemed like rather bland fanservice that everyone was coincidentally there and the new characters in the movie were all pretty 1 dimensional and really nothing note worthy. I absolutely did not enjoy this movie and it is beyond me how anyone out there could enjoy it if they watched the same movie as I did and it even makes me sad that the movie was such a disappointment because the main series had a lot of really good moments, but this movie didn't had any. Overall the movie is a 1/10 for me and I guess the movie was just a quick cash grab from studio bones so they have budget for Mob Psycho S2. Hollywood has yet to master how to make successful live-action adaptations of anime, and they've chosen to take on what may be their biggest challenge to date. Boku no Hero Academia The Movie hits international cinemas this week, so here's our summary and review of the latest installment in the ever-growing superhero franchise!